Honorees Joe Rucci, left, and Jay Forgotson, right, with Scout Speakers Aidan Orr and Julian Matrullo from Stamford Pack 11 and, behind, Master of Ceremonies Eagle Scout Sean Nulty. 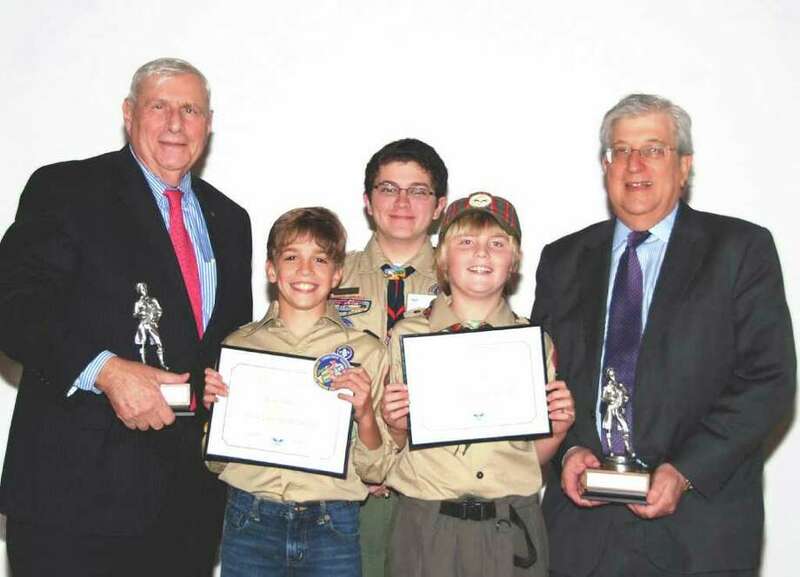 Local businessmen Jay Forgotson, Joseph Rucci, Jr. and Bobby Valentine were the honored recipients of the Boy Scouts of America Connecticut Yankee Council "Good Scout" Award at the annual tribute dinner at the Stamford Marriott Dec. 1. Forgotson is the CEO of The Bank of New Canaan, The Bank of Fairfield and the bank holding company, BNC Financial Group. A longtime advocate for urban education, Forgotson has held board positions on the Bridgeport Regional Business Council, the Kennedy Center of Bridgeport and the Stamford Chamber. He was a boy scout for nearly five years. Rucci is a founding partner of Rucci, Burnham. He is a director and chairman of the governance committee of the AmeriCares Foundation, Inc. and a director of the Pear Tree Point School Foundation in Darien. Valentine is an MLB Player, Manager, ESPN Analyst and director of Public Safety for the City of Stamford. Valentine has just been named the new manager for the Boston Red Sox. He received the "Good Scout" award in his absence; as he was at a press conference in Boston announcing his new appointment.